On Saturday 18th August we are hosting an event to celebrate Women in Coffee, bringing together some great local enterprises run by women that are really starting to make waves in the industry. Girls Who Grind is an all female coffee roastery run by Fi O’Brien and Casey Lalonde just down the road in Frome. They source all their beans from female growers, and support projects that empower women and promote gender equality. We will be serving their coffee in the bakery on the day, and you can meet the roasters themselves as well as buy a bag of beans for brewing at home. 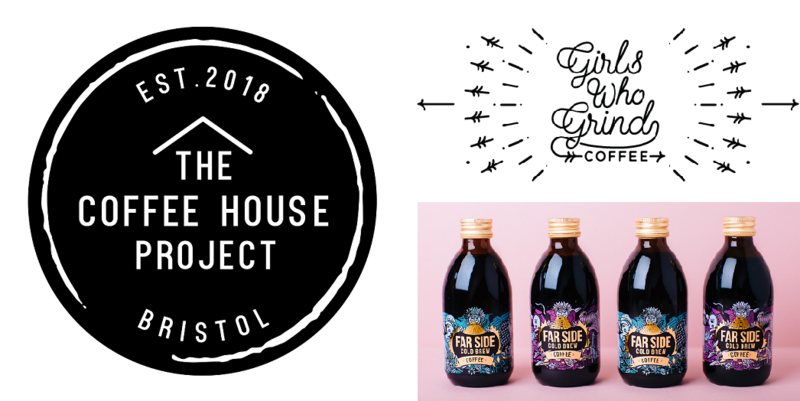 Founded by Kadie Regan in 2017, Far Side Coffee specialise in cold brew with rich, vibrant and refreshing flavours. Kadie sources her coffee exclusively from female coffee alliances and uses an 18 hour process to bring out the natural flavours of the beans. She’ll be with us all day so come and have a taste and prepare to be awed! Spearheaded by Louisa and Sofia this festival of coffee will take place at the Passenger Shed in September. Bringing together the very best baristas, roasters, suppliers and equipment as well as talks, competitions, workshops and trade stands representing every aspect of the coffee industry. They will be on hand at the bakery all day with more information of what you can expect, as well as selling tickets for the festival.